Demo went well. OMG Scoble! Lots of good info. Mmm burgers. ❤ meeting Twitter buds IRL. No open bar? Glad you like Ranker. KIT! Goodnight. As women in a mostly male-dominated field, it’s easy to have a tenuous relationship with the idea of ‘beauty.’ After all, we want people to focus on the skills and savvy we bring to the table, and not necessarily on the brand of purse we put down on top of it. If you’re a female who deals regularly with developers, this balancing act can be even more precarious. How do you justify spending time on hair and makeup when most of the men you’re working with would rather worry about HTML than hygiene? But, it’s hard to ignore the effect your appearance has on your confidence. And, any successful woman – or man for that matter – will tell you that confidence is a key component of that success. So, many of us still take the time to do our hair. To put on a little makeup. To pick out that perfect outfit. It doesn’t make us any less skilled or savvy, it just makes us feel a little better as we go about our daily business. What we don’t realize is how lucky we are to be able to do that for ourselves. And, that’s where GlamourGals comes in. GlamourGals is an organization that arranges makeovers and beauty treatments for women in nursing homes. By hooking young women up with their elderly counterparts, the organization provides both parties with opportunities to foster meaningful relationships, and also helps those elderly women to get that same little beauty boost we all know and love. It also has an amazing social media component, in its use of a proprietary networking site for all of its chapters, which helps the organization keep infrastructure costs low and connectivity high. Started in 2000, GlamourGals is now having its tenth birthday party in LA, giving glamorous gals across the LA area the chance to celebrate and support this very worthy cause. The party is at Bimi Restaurant, on February 25. There will be complementary cocktails, raffle prizes, food and gift bags, and the whole thing kicks off at 6pm. Hosts include Lauren Berger and Laurel Kaufman of our very own GIT LA chapter, and Girls in Tech members get $10 off ticket prices through the first week of February. So, break out your best beauty products and start primping – this is one event worth getting all dolled up for. If you haven’t checked Seesmic Look out yet, it’s worth downloading and playing with a bit. Good way to hone in on who’s talking about the specific stuff you’re targeting vertical-wise, and also a good way to visualize what’s trending. Not a replacement for the desktop twitter client, but certainly a good enhancement, especially if you’re looking to amp up your relationship-building and trend-targeting efforts on Twitter. Spam Pics: Good Spam Does Exist! Once again, the internet saves me from an otherwise headache-of-a-day. In this case, a headache caused by multiple server crashes and a mild sinus infection. Of course, as is generally the case, turns out today’s problems were nothing that a little processed meat product couldn’t cure. In this case, we’re talking about the lovely piece of spampersand above — a perfect example of all the good things that can happen when one mixes sculpture, grammar and pig products. At least, we hope that’s actually pig product. Anyway, once again, I have to say thank you to the fine folks of the viral web for providing me with a lovely late-afternoon laugh. And, this might be the only time I can confidently say that a piece of internet spam just totally made my day. First Person Tetris: Nostalgia + Dizziness = Gaming Gold? Do not adjust the settings on your screen. That screenshot is indeed sideways, and it is intentionally so. That’s what it looks like when you play first person tetris. Which is why I could only stand to relive this particular childhood memory (oh, how I miss my Gameboy) for a few minutes before I had to either pause the game or pick up the puke bucket. That said, this rotating retro throwback is a pretty ingenious idea, not to mention well executed. The site is simple, the interface is straightforward and — most importantly — the game is still as fun as it was when I was riding in the back of my mom’s Expedition during middle school carpool. All in all, I have to give this one a great big geek chic chick shoutout. At the end of the day, there’s only one word for something so straight-outta-the-90s awesome, so say it with me folks…this site is totally rad. See this post in its original format on Girls in Tech. So, you’re looking for a social media job. You want to be a content coordinator, a social media marketer, an editorial executive, whatever. You’ve polished up your resume, rounded up your references and picked up the perfect pair of interview shoes. You email every one of the social networking jobs on the web. And then you wait. And wait. And wait. And meanwhile, I’m sitting at my desk, sifting through resumes and wondering why we can’t find anyone halfway decent for social media openings at our company. So why aren’t you interviewing with me? Well, assuming you’re a qualified candidate, then the problem is probably your cover letter. You see, your cover letter is a lot more than a simple intro for your resume and references. It’s a first impression of your qualifications. And, in many cases, it’s the only impression that busy person on the other side of the screen is going to get before they decide to dismiss you completely. So, how do compose a killer cover letter? Simple. Just follow the three P’s. Personality, profiles and proofreading. Personality is probably the trickiest of the trifecta. Social media certainly ain’t a 9-5 gig, so when I’m screening resumes, I’m always aware that I’ll probably end up spending more time with the person we pick than I do with my friends and family combined. A little personality in your cover letter is a great barometer for me when making those decisions. But, show too much personality, and you might come across as unprofessional. So, I’ll gladly read colloquialisms, creativity and even the occasional quip. Emoticons and excessive exclamation on the other hand will probably get a less positive response. And don’t forget, one person’s treasured triple-exclamation-point sign off might just be another one’s personal pet peeve. (Hint, hint). If you’re applying for a job in social media, the profiles part should be the easiest part of this equation. Just make sure you include links to all of your social media sites. And you might as well include the personal and professional. Don’t think I’m not gonna google it if you don’t. When we’re hiring for a heavy social media job, we want to see people with a presence on the social web. So,I’m looking at your ratio of Twitter followers to followers, your number of tweets, your social aggregator accounts, your blog, your boyfriend’s blog — whatever I can find to prove that you know your way around the web. You don’t need to have your fingers in every profile pie, but you should have some background in this whole social networking scene. If you don’t, then you better have a backup plan for proving to me that you’re the person for the post. Last, but not least, make sure you proofread. If I had a nickel for every typo, grammar gaffe, misused word or spelling mistake I’ve seen in cover letters over the past year, I could probably afford to just fund the invention of a robot who would cover all of our open job posts, so I’d never again have to stare in disbelief at the cover letter of a college graduate who can’t tell the difference between ‘their’ and ‘there.’ Seriously, I can’t stress the importance of proofreading your cover letters enough. This is also true for emails sent from mobile devices. If it’s the first piece of writing I’m going to be seeing from you, it’s worth a few extra minutes of meticulousness. At the end of the day, crafting a killer cover letter comes down to this: you could have the best background of anybody on the web, but if your cover letter is awful, it’s like hiding a gorgeous gown under a crappy coat. What’s the point? If you’re going to invest in the gown, make sure you spend some time on the outerwear too. After all, it’s the first layer of your first impression. And, the first step towards scoring a chance to show off those interview shoes. See this post in its original format on Speed LA Dating. So, you’re tooling around town with that special someone when suddenly, hunger strikes. You need food, and you need it fast. You also need it to work for your low-carb, low-fat, macrobiotic vegan diet. Or however it is you happen to be eating this month. Hey, nobody’s judging. It is LA after all. Fortunately, in this land of Mozza and Matsuhisa, Oki Dog and Kogi BBQ, there are as many options for satisfying your stomach as there are surgeries for stapling it up afterward. Which begs the question – when you’re standing on the sidewalk in a strange part of the city, trying to impress your date with that perfect palate pleasing pick, how do you figure out which restaurant is the right one? Lucky for you, there just so happens to be an app for that — and no, I’m not just talking about the drool-worthy biscuits at Animal on Fairfax. I’m talking about the kind of app that accessorizes your phone and makes your life a whole lot easier in the process. And, in fact, there are multiple applications that can turn your favorite iPhone, iPod, Droid, Hero, Blackberry, Palm or carrier pigeon into your very own, personalized Zagat Guide. Okay, so you’re probably not going to find an app for your favorite carrier pigeon. But, I guarantee you, any of these apps will help you find a place that’ll serve that sucker up on a silver platter. Everyone knows about Yelp. Even my mother – who thinks Twitter is something you do when you’re stifling laughter – knows about Yelp. But, did you know that Yelp has a secret, special feature? 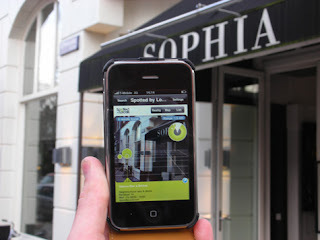 It’s what’s called an “Easter egg” in the web business, and basically, it turns your iPhone 3GS into a 3D experience. Using technology known as augmented reality, the Yelp app will literally layer Yelp’s listings over the real, live world. So you can literally see what’s near you, and what other people think of the place — sort of like google street view for your cell phone. Don’t have an iPhone? Don’t worry. The Layar app will do the same 3D thing with even more features — you can set favorites, see stories about what you’re looking at and more. And, it works on any Android phone, as well as on the iPhone. Augmented reality is awesome and all, but what if you just want to find a place that fits your picky preferences? Enter UrbanSpoon. This fun little app lets you set up a search by location, cuisine and cost. You can also set separate filters like popularity, no chains, distance, etc. Or, for a really fun experience, just turn it on, and shake it up. It makes a sound like a slot machine and serves up a random mix of results — perfect for picking out an appetizing adventure. You can get it for the iPhone and Blackberry, and you can also get it on any phone via text. Great interview with Drew Olanoff (formerly of @Drew) in Lalawag today. As usual, Sean Percival asks the questions I would ask if I were to suddenly find myself deep in conversation with the unofficial spokesman for all things social good (not to mention all things anti-cancer). It’s definitely worth a read for a little Friday afternoon inspiration.